Shipping internationally can be a daunting task. Everything you’ve learned about domestic shipping goes out the window, and you have to add new processes to make sure your packages are delivered in a timely and cost-effective manner. 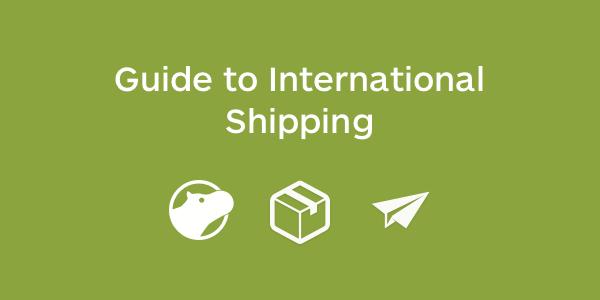 Having helped thousands of businesses ship to countries all over the world, we’ve put together a guide to help you setup your first international shipping operation. Let’s start with the essential, you need to find shipping carriers deliver your shipments to your customers in a timely and cost-effective manner. Begin by evaluating who your customers are and what you are selling. Some customers may be more cost-sensitive and patient, while others are willing to pay more for faster delivery. If you’re selling a premium product, customers are also going to want to get detailed tracking information to keep tabs on their purchase. Since there’s a much greater difference across speed, service, and cost for international shipments, the most important take away is to provide your customers many options so that they can select the one that best fits their needs. Even if you opt for flat rate tiers, since shipping costs are much higher for international shipping, you should still consider diversifying your carrier portfolio to rate shop. DHL Express is a private carrier with an established global presence. They will be responsible for the shipment from pickup to delivery, providing detailed and reliable tracking information at every step. Especially important during the holiday season, DHL Express will work directly with the importing country’s customs authorities to ensure that packages are not stuck in queue to be cleared at the border. Dive into the nuts and bolts of implementing DHL Express. USPS has 3 different types of international service levels: First Class International, Priority Mail International, and Priority Mail Express International. The benefit of shipping with USPS is that you can just drop it in the mailbox or the same process you would use for domestic shipments. The caveat to shipping with national postal service such as USPS is that they are not responsible for the shipment from pickup to delivery. At the border, your shipment will be transferred over to the local postal service for delivery. Depending on the country you may lose all tracking visibility. For most international shipments*, you’ll need 2 sets of documents – a customs form and a commercial invoice. On Shippo, you can easily input all the necessary information you need as part of the label purchasing process and we’ll generate the appropriate paperwork for you. The customs “form” is additional information that appear as part of an international shipping label, not an additional form. 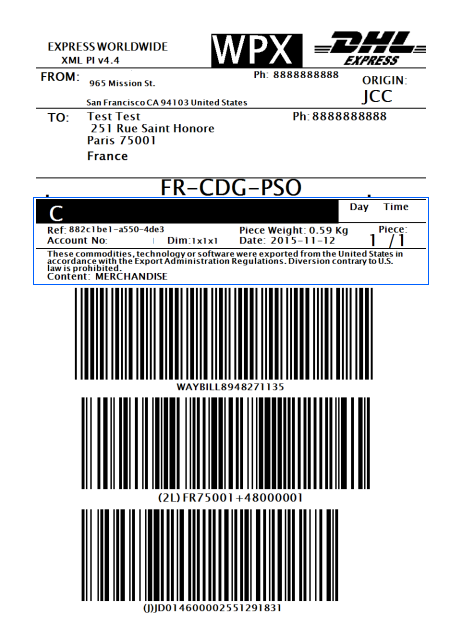 3 copies of the commercial invoice needs to be placed inside a clear pouch on the package. It needs to be removable and visible, so that the customs officer can review the information. *USPS is one of the few carriers that do not require 2 separate pages for international shipments. All necessary information is already included as part of the international shipping label. Contents Type – select amongst: “merchandise,” “sample,” or “gift”. It is illegal to mark an item as “gift” when it’s not. Some customers may ask you to do that to avoid import taxes, but you’ll be the one liable if it’s discovered. This is you, the shipper. Incoterm – who to bill for customs duties and fees. DDU (Delivery Duties Unpaid by Sender) meaning recipient is responsible for any duty incurred. DDP (Delivery Duties Paid by Sender) meaning you as the shipper will be covering the costs. 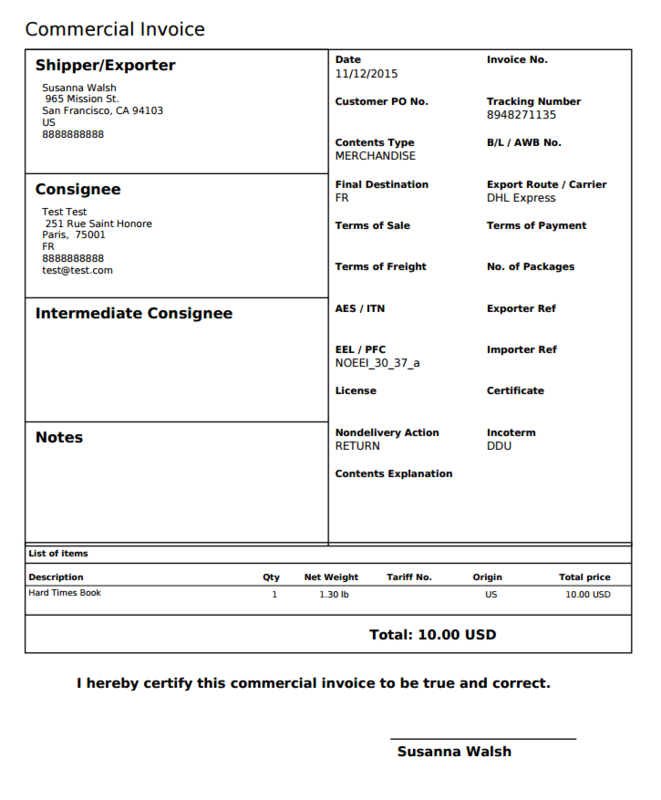 Customs Items – brief description of the item being shipped, along with weight, quantity, value and country of origin. Tariff Code (HS code) – a product-specific code as documented in the Harmonized System (HS) maintained by the World Customs Organization (WCO). Tariff codes exist for almost every product involved in global commerce. Required on official shipping documents for tax assessment purposes, a tariff code ensures uniformity of product classification worldwide. If you’re working with a private shipping carrier like DHL Express, your packages will be routed to one of their distribution centers. One of the benefits of working with a private carrier like DHL Express is that are a registered customs broker who will manage all questions from the import country authority on your behalf. However, this does not mean that you’re exempt from restrictions and duty. The most unpredictable part of international shipping costs are the customs duties and fees. These can change month to month, vary by time of year, or differ based on the customs officer handling your package. However, you can use an online calculator like Duty Calculator for an estimate. It’s also important to think about whether you want your customers to pay these fees – which is standard – or if you want to absorb them yourself. You should consider purchasing insurance for your international shipments, especially if you are selling a fragile or premium product. There are a lot more handling and transitional points where your package can be damaged, lost or stolen. Through Shippo you can purchase insurance easily in the first step of the label process. We offer insurance for all carriers through our partner Shipsurance. Learn more about when, where, and how shipping insurance works. Dealing with international returns is a potential nightmare for the customer and the business. The key is to make sure that you have a clear policy in place for international shoppers. Consider only allowing returns on items that make sense to ship back or be clear that international customers have to return items at their own cost. Unfortunately, you probably can’t afford to have the same customer-friendly policy for international customers as you do for domestic customers. For the convenience of your customers, you should display product and shipping costs in the local currency of the country you’re selling in. This way, you won’t risk customers leaving your site to calculate the conversion. Most shopping carts support displaying prices in various currencies. If you’re selling on international marketplaces, such as Amazon Spain or eBay UK, consider setting up a local receiving account with a foreign exchange and international finance service like World First to avoid getting hit with a conversion fee and poor exchange rates. There’s a lot to consider with going international, but hopefully now you have a better sense of what you need for shipping. To see what it’s like to create an international shipping label and the cost of shipping, plug in a few trial orders on the app. We offer discounted DHL Express and USPS shipping rates immediately upon signup and generate your international paperwork for you. Let us help you expand your customer base around the world.